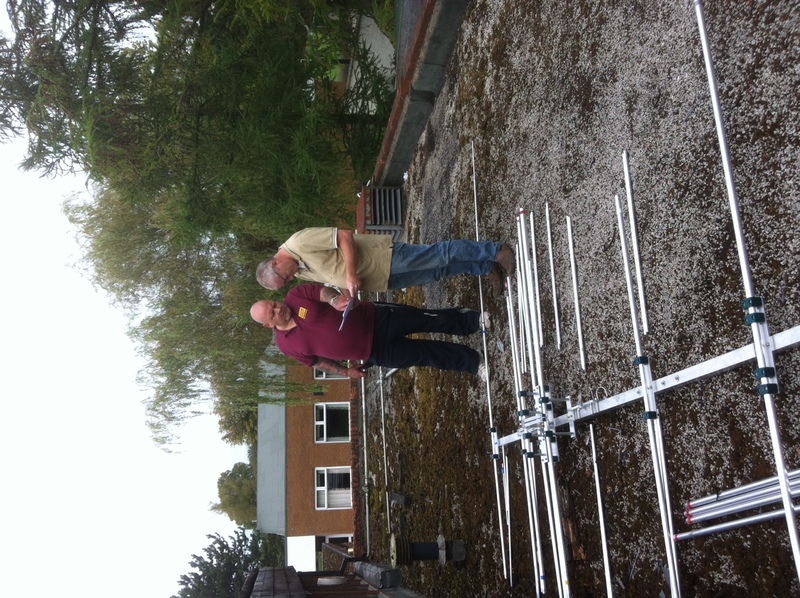 More news on the antenna rebuild at Wythall Radio Club. Chairman Mike has been leading by example on this project! 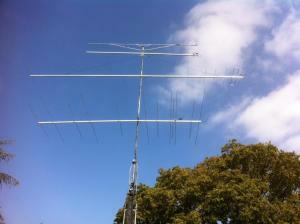 The most recent days work involved him being joined by Kevin 2E0NCO and John M1JSS. Together they spent a few hours building the elements and the remaining boom assembly for our new Innovantennas five-element HF beam. We are pleased to report that everything went well – the antenna is ready to be attached to the tower mast, once we have finally confirmed we have installed all the element sizes in the correct order – it’s a complex bit of metal to put together when you’ve never done it before! Having fun at the Hamfest! 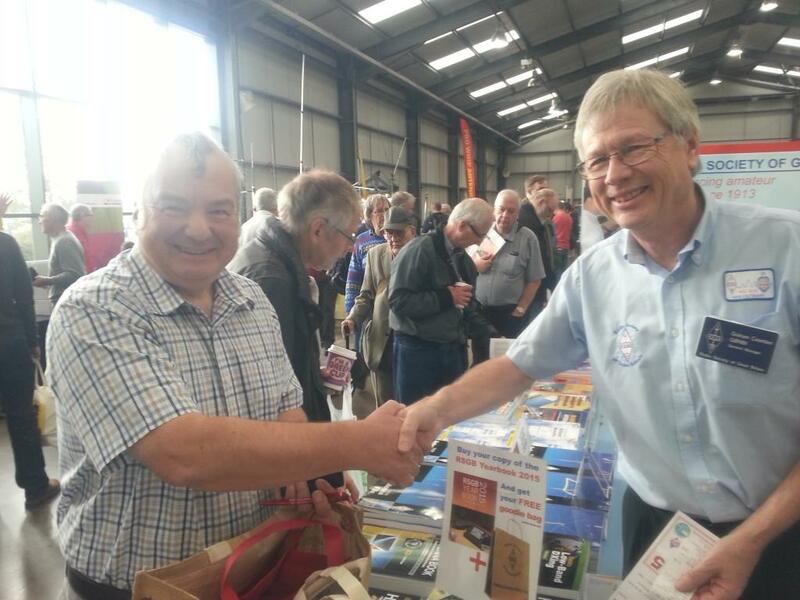 Members of Wythall Radio Club joined in with the members of most UK radio clubs this weekend in visiting the UK’s National Hamfest. Ian M0IDR insists only the General Manager should serve him at the RSGB stand! Cruel! Several folk from Wythall made the trip north to Newark in Nottinghamshire; Chairman Mike G4VPD & Treasurer Ian M0IDR headed the throng – others tagging along included Phil 2E0WTH, John M6FBO, David G7IBO, Jon M0JMM & Chris G7DDN. It was great to see and meet so many friends and make new ones while we were there; and of course there were new goodies to tempt us all! A fantastic day out, though one feels a little for David G7IBO, who was planning to go back on the Saturday(!) but had to stay at home to look after his poorly wife, Juliet M6RSC! 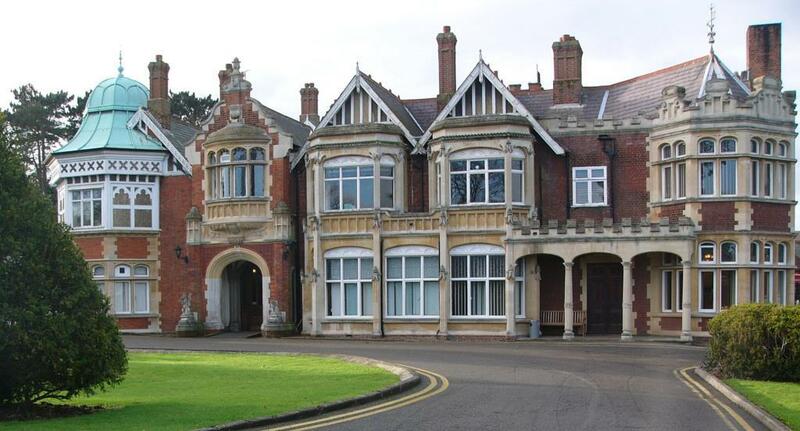 Bletchley Park – a place of pilgrimage for Radio enthusiasts? 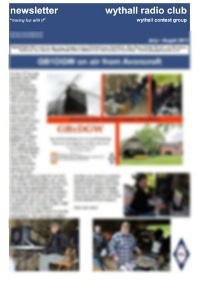 You could be forgiven for thinking you are reading a different website, but you’re still tuned to Wythall Radio Club! 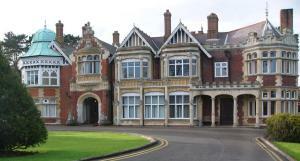 “The Bletchley Park Story” is actually the title of our presentation this week! On Tuesday (23rd September) we are looking forward to welcoming a very special guest, Ray Goff G4FON. Ray is known to many radio amateurs as the writer & programmer of the G4FON Morse Tutor software for Windows. However many folk are not aware that Ray has an “alter ego”, in that he is a Bletchley Park Volunteer Tour Guide! This makes him the ideal person to visit us to talk about Bletchley Park and its place in radio history. Ray particularly expressed an interest in talking about this part of his radio life when the invitation to him was first mooted. Since many members of Wythall Radio Club have visited Bletchley Park, we know that his talk will be very popular! As a result, we are expecting a large turnout for this evening, so early arrival is highly advised. The talk takes place in the Darts Room at Wythall House, Silver Street, Wythall B47 6LZ and starts at 20:30. Visitors are always welcome but be advised that we do have a whip round of 50p each to help pay for the room hire, so make sure you have a few pennies left after you’ve bought your pint from the Wythall House bar! The UK has been enjoying an Indian Summer over the last couple of weeks. 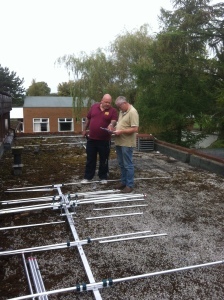 And that has meant more news on the antenna front at Wythall Radio Club! 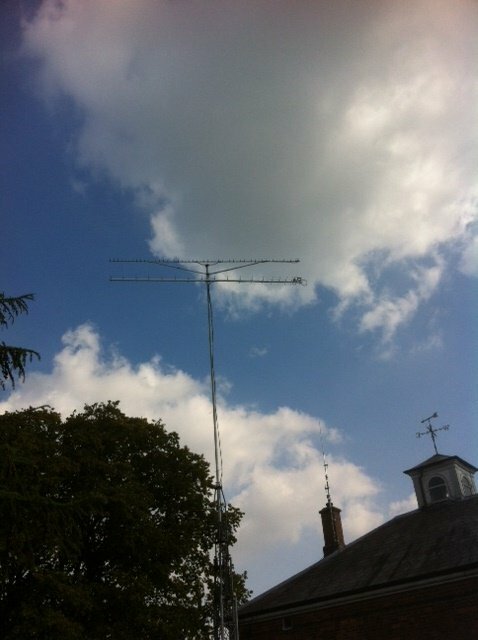 23cms, 70cms, 2m and a dual 4m/6m set of beams sit atop the Wythall Radio Club mast! 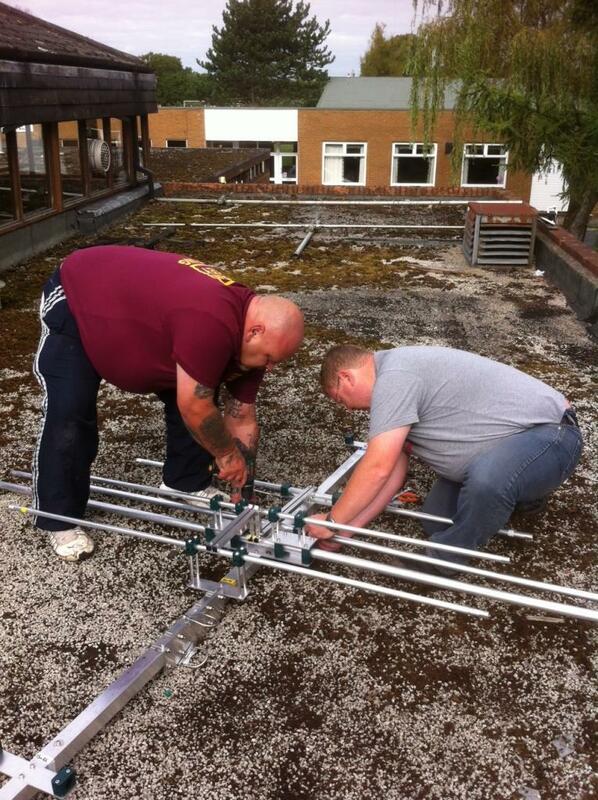 Members have been been busy preparing our tower, replacing luffing cables and starting to construct our new antenna arrays. Thanks to our friends at Innovantennas and Martin Lynch & Sons, we have been able to put together a great set of aerials to cover all bands from 20m to 23cms. Putting them together and getting them up in the air has been no mean task but we are almost there! The VHF and UHF arrays now proudly sit atop the mast and the last antenna to go on, the 5 band HF beam, is currently being constructed. We now just await one more kind weather day so we can finish the job. Enjoy a look at some of the recent developments – we will let you know when it is finished! There have been yet more successes today in a recent Foundation Licence Course held at Wythall Radio Club. Four students, all of whom have been working on our innovative Online Foundation Course, visited us in person yesterday to complete their Practical Assessments. As part of this they had to learn how to connect up equipment, make basic measurements and then operate real radios, making real contacts. They also had a bit of fun using Morse Code, sending and receiving under guidance. Under the instruction of WRC’s Training Coordinator Chris G0EYO, ably assisted by Peter G4LWF and Barry M0DGQ, students John Borthwick, Les Emmanuel, Carl Jenkins and Dave Cull all completed the required tasks. 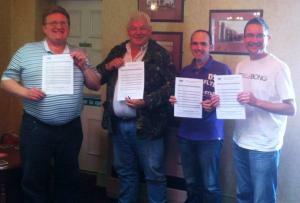 As a result, they were all able to sit their Foundation Examination earlier today at Wythall Radio Club. We are extremely pleased to announce that all four passed the exam and are now awaiting their new M6 callsigns. Well done to you from all the members of Wythall Radio Club!